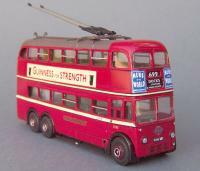 The Trolleybus models currently available may be checked out by clicking on the bus-blind links on the left. The resulting pages show the Prototype Information for each of the kits, a prototype photo if available, and then photos of a finished kit if it has been released. On the 9th May 1962 Londons last service trolleybus pulled in to Fulwell garage. That was almost exactly 31 years after the first fare paying passengers had ridden on a trolleybus in London on the 16th May 1931, again operating from Fulwell garage. To those who can remember it no doubt seems strange that more years have passed since their end than passed during their operation. During those operations trolleybuses spread over all of London although much more noticeably north of the Thames than south. Introduced as they were to replace trams throughout the city the whole process was planned to take some years and its completion was interrupted by the outbreak of World War II, although the momentum of deliveries carried on the replacement into 1941. With the small exception of the routes passing through the Kingsway subway all trams north of the river were replaced, but the majority of those south of the river remained until 1952 by which time the decision to replace them with diesel buses had been taken. South London dwellers thus never were to see trolleybuses on main trunk routes such as those to Croydon and Purley (although there was the small compensation of experiencing the Feltham trams displaced from their northern routes). Although no tram routes were replaced after the war new trolleybuses were ordered to replace the original London United buses of 1931. These new Q1 Class BUT 9641T buses were regarded by many as the Rolls-Royce of trolleybuses and apart from being 8ft wide and having five bay construction the new buses maintained the same smart and attractive lines of all trolleybuses delivered to London Transport. Indeed, even today the buses still have a handsome, clean appearance. When they began to appear in the mid-30s they must have seemed very modern and streamlined. At its peak the London trolleybus fleet was the largest in the world and contained more that 1800 trolleybuses. All these buses were (with the single exception of fleet number 63, a four wheeler) three axle six wheelers and had double deck bodies. One way and another all came from either Leyland or AEC (even the BUTs being from a joint venture of those two companies), but some were chassisless or of unit construction. The first sixty AEC vehicles, always known as Diddlers and supplied originally to London United, did not have the appearance of the subsequent fleet and indeed, with their half cab bodies, could have been mistaken for more conventional buses. In the end, the final runs were made with L3 Class vehicles (the more advanced Q1s having been sold on while they still had resale value) with a ceremonial appearance of Diddler No. 1 that had been extracted from London Transports museum for the purpose. The very last bus, No. 1521, has been preserved in running condition.